Custom Pillow Source offers a wide variety of indoor pillows including bolster pillows, throw pillows, toss pillows, floor pillows, and body pillows. Dress up your indoor furniture with coordinating accent colors in the form of a beautiful indoor pillow. With over 150 furniture grade Sunbrella fabric and over 50 indoor fabrics to choose from, finding the perfect color or design should not be a hard task to accomplish. 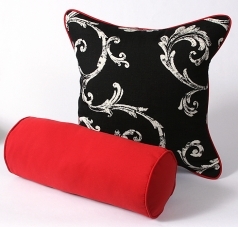 Our custom indoor pillows are filled using a poly-bun material and have a hidden zipper for easy cleaning. Custom Indoor Pillows made by Custom Pillow Source are all manufactured right here in the United States. We offer various styles, sizes and shapes for our indoor pillows. Whether square, rectangle or round; all with the options of knife edge finish or a cording finish. Let Custom Pillow Source, dress up indoor furniture and living space with a splash of color in the form of custom indoor pillows.